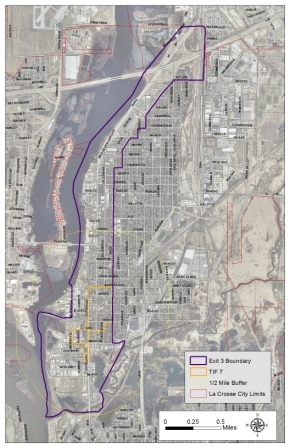 With the help of Chamber investors, Chamber Executive Director Vicki Markussen is one of several individuals representing the voice of businesses, residents, developers and others as a master plan for Highway-53’s corridor (and several blocks surrounding it) are envisioned for growth. The group, with public input to consulting planners hired by the city have identified several nodes for improvement have been identified. The nodes are economic hubs that, when planned correctly, can spark growth that positively impacts the neighborhoods surrounding the corridor from I-90 to downtown. The nodes are identified in the below map. Create connectivity of beach to green space (on sides of trailer homes). New “gateway” building at corner (Hardee’s) that sets the tone for the corner.